C.U.B.E. 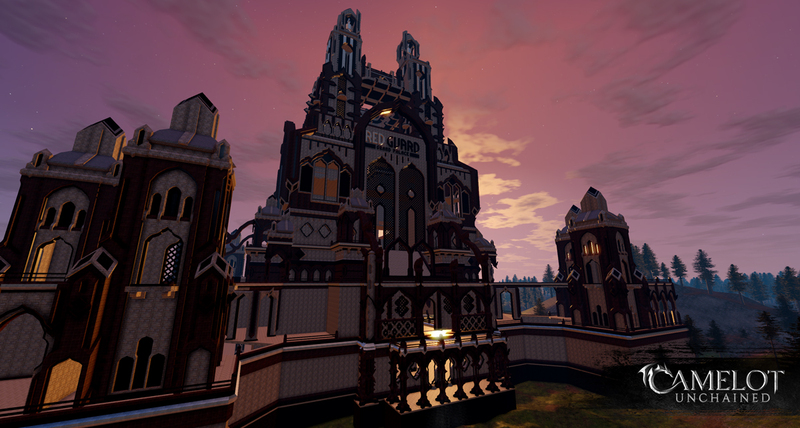 stands for Camelot Unchained Building Environment, a hybrid online/standalone building game which is being developed as part of Camelot Unchained™. Currently, we are using it to test all aspects of the building system, including destructibility, physics, UI, etc. The system works similarly to the way it was featured on Kickstarter, and should provide a building system in the spirit of games that went before us (including Minecraft™, of course), but that is also distinct from them. C.U.B.E. may be expanded in the future to be a true standalone game if there is demand for it. C.U.B.E. has the same basic “origin story” as games like Minecraft, Trove, and others, in that it is a game in which players can manipulate blocks to build structures. But from there, things begin to diverge quite a lot. 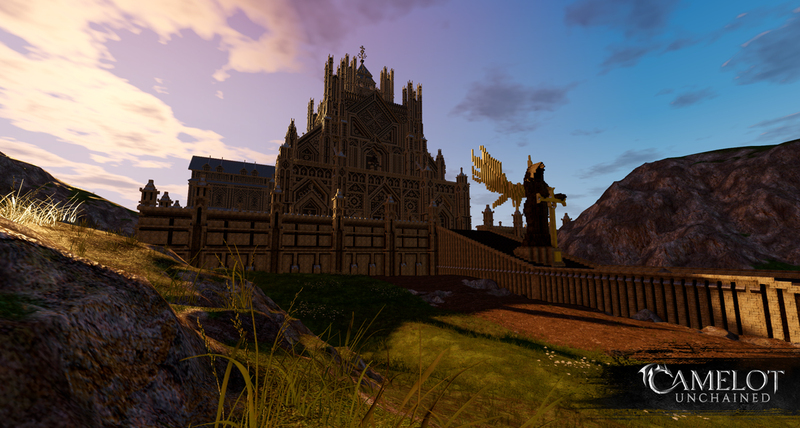 To begin with, C.U.B.E.’s graphics and engine is the same one that drives Camelot Unchained. So, “cubers” will not be building in a retro-graphics game, but will enjoy the same level of graphics, effects, and general quality of a modern MMORPG. Additionally, C.U.B.E.’s UI, just like Camelot Unchained’s UI, is built using Chromium, so writing add-ons, mods, etc., are quite easy. Further, C.U.B.E. can use real world physics (player’s choice), so that buildings have to be structurally sound to exist in the world. Through improved graphics, physics, UI, and so much more, C.U.B.E. is taking the core concept of building blocks to the next level. And the best part? It comes along with our game, at no additional charge to our Camelot Unchained Backers! Added the option to build in a new zone that uses our new terrain engine. Added 20+ materials for a total of over 70 materials to build with! 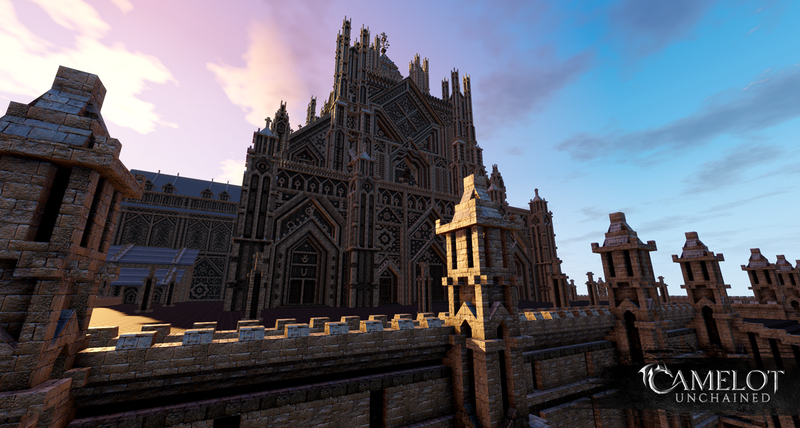 Significant improvement in building rendering performance. Significant improvement in blueprint performance. Significant visual and performance improvements to both world and characters. Added ambient music and sound as well as character movement sounds. Several bug fixes to improve UI, chat, and general stability. Once you pledge to Camelot Unchained, you also gain access to C.U.B.E. No additional charge, no VIP access required - you pledge, and you’ll get to play with C.U.B.E. to your heart’s content, during your pledge’s stage of Alpha/Beta development and beyond. Oh, and one more thing: While we are in Alpha testing right now, C.U.B.E. access is as close to 24x7 as we can make it. So, if you’re an Alpha Backer, there’s no need to wait for scheduled tests! Pledge at our Alpha level, and you’ll be playing with C.U.B.E. as soon as you can download the game. Our Beta players will also get almost 24x7 access to C.U.B.E. when Camelot Unchained enters their pledge’s stage (Beta 1, 2, 3 and 4). Update: Alpha and Beta One Backer levels currently have access to C.U.B.E. !